In their book about the Quasiturbine, the inventors have used a set of 14 engine parameters to show than none of the modern engine meets simultaneously all the optimum general demanding criteria. Engines fail to be "all in one" compact, low weight, low noise, zero vibration, high torque at low rpm, efficient on a wide power range... While having homogeneous clean combustion and being multi fuel capable... With our today's Beau de Rocha (Otto) mode piston gas engine, about half the gasoline used in the transportation sector is literally wasted to fight the intake atmospheric vacuum depression generated by the carburetor or injector manifold butterfly-valve (The engine-braking effect). This is half the pollution of the transportation activities! Engines are at the end of the energy chain, and their pollutions affect the most immediate users environment. Better engines are keys to better environment, not only because of their own improved efficiencies, but also because any bit of improvement has directly amplified impacts on all anterior stages of the energy cascade and industry. This is the reason for Quasiturbine! In the context of the international environmental and resources depletion discussions such as the Kyoto Accord, and taking into account the general population conviction that climate changes are currently endangering our planet, there is a new sense of urgency mandating that no energy technologies can be discarded, and this is particularly true of any sound engine concept breakthroughs. The Quasiturbine technology is among the very few energy and environment tools we have to address our present concerns, and one precious new means available to improve our vital collective objective. It goes without saying that acknowledging its existence may fall into the realm of a social obligation. The Quasiturbine is a no crankshaft rotary engine having a 4 faces articulated rotor with a free and accessible center, rotating without vibration nor dead time, and producing a strong torque at low RPM under a variety of modes and fuels. The Quasiturbine can also be used as air motor, steam engine, Stirling engine, compressor and pump. 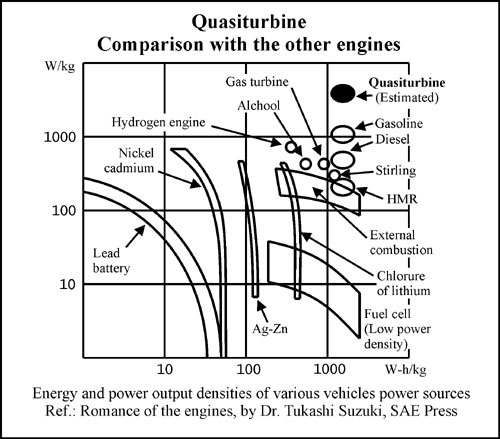 The Quasiturbine is also an optimization theory for extremely compact and efficient engine concepts. it perfects the piston, and improves upon the Wankel. The Quasiturbine is universal in relation to energy sources: Liquid and gaseous fuel, hydrogen, steam, pneumatic, hydraulic... The Quasiturbine engine was invented by the Saint-Hilaire family and first patented in 1996. The engine makes use of a complex computer calculated oval shape stator housing, creating regions of increasing and decreasing volumes as the rotor turns. It is capable of burning fuel using detonation, the optimal combustion mode of the future... the piston cannot stand. In the Quasiturbine engine, the four strokes of a typical cycle de Beau de Rochas (Otto) cycle are arranged sequentially around a near oval, unlike the reciprocating motion of a piston engine. In the basic single rotor Quasiturbine engine, an oval housing surrounds a four-sided articulated rotor which turns and moves within the housing. The sides of the rotor seal against the sides of the housing, and the corners of the rotor seal against the inner periphery, dividing it into four chambers. 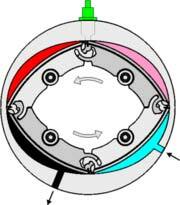 As the rotor turns, its motion and the shape of the housing cause each side of the housing to get closer and farther from the rotor, compressing and expanding the chambers similarly to the "strokes" in a reciprocating engine. However, whereas a four stroke piston engine produces one combustion stroke per cylinder for every two revolutions, the chambers of the Quasiturbine rotor generate height combustion "strokes" per two rotor revolutions; this is eight times more than a four-strokes piston engine. Because the Quasiturbine has no crankshaft, the internal volume variations do not follow the usual sinusoidal engine movements, which provide very different characteristics from the piston or the Wankel engine. Contrary to the Wankel engine where the crankshaft moves the rotary piston face inward and outward, each Quasiturbine rotor face rocks back and forth in reference to the engine radius, but stays at a constant distance from the engine center at all time, producing only pure tangential rotational forces. Hydraulic, pneumatic, steam, gas and fuel combustion... produce primary energy in the form of expansion and pressure. Being an hydro-aero-static device, the Quasiturbine directly transforms this pressure energy into mechanical rotation motion with optimum efficiency, whatever low or high is the pressure (QT idle with only a few psi !). Conventional turbines are hydro-aero-dynamic, and they cannot handle directly the energy of pressure which must be converted into kinetic energy. For a given geometry, the efficiency of conventional turbine falls rapidly if the flow velocity moves away from the optimum. Because the Quasiturbine does not require the pressure energy to be converted into the intermediary form of kinetic energy, it has numerous advantages over the conventional turbines, including on the efficiency at all regimes. Many researches are going on to increase energy efficiency on the long term with piston, hydrogen, fuel cell... Hybrid concepts are ways to harvest part of the "low power efficiency penalty" of the piston engine used in vehicle, but counter-productive measures limit the long term perspective until they could efficiently fuel from the electrical grid. None of these solutions are short term stable and competitive. The Quasiturbine in Beau de Rocha (Otto) cycle is a relatively simple technology which could be widely used within a few years with substantial efficiency benefits over piston engines in many applications. Large utility plants convert energy more efficiently than small distributed units and should be favored when possible, but on the long term, the Quasiturbine detonation engine is one of the very few means to match utility efficiency the distributed way, while being as chemically clean as possible. is a factor attenuating the violence of detonation.